In many bootstrapped companies, the product development process starts with ideas for new features from management, sales, customers, and others. Those features are then prioritized based on expected return and cost to develop, put on a roadmap, and sent to the development team. Sound familiar? If so, a flawed assumption may be holding back your company’s ability to quickly and efficiently improve your customers’ experience. The issue with feature roadmaps is that they conflate a feature with the outcome the team hopes that feature will accomplish. For instance, a company might develop a new dashboard with the goal of increasing the time users spend in their application. From the moment it’s decided that the feature should be developed, it’s simply assumed that the dashboard will in fact lead to more time spent in the app. The company is evaluating its team based on whether the dashboard feature gets built successfully, but really that’s not what matters. What the company really cares about is keeping users in the app longer—the dashboard may or may not do that. The Objectives and Key Results (OKR) framework helps solve this problem by focusing on intended results, instead of specific features. Invented by Intel and adopted by tech industry giants like Google, OKRs have become an accepted best practice for managing tech products. The foundation of an OKR system is that priorities are articulated as objectives, instead of features. In our dashboard example, the original idea may have been a dashboard, but an objective can be extracted from that idea: the company wants to increase user engagement. The next step is identifying measurable results that would indicate success against that objective, for example increased logins and session times. Moving to OKRs will require modifying the entire product development process, starting with executive-level planning and continuing through testing and development. The first step is setting a medium-term vision for the product (or company, if one product represents all or most of its business). Three to five years from now, what types of customers will the company serve, and what kinds of services will it offer? Setting a vision also requires considering what the market(s) the company plays in will look like in the future. Vision informs product strategy—in the nearer term, what are the company’s goals for specific verticals, segments, geographies or channels? This strategy-setting process should happen at least yearly. Objectives are sub-bullets on how the strategy is to be undertaken, and key results are outcomes that measure whether those objectives have been met. These are goals for a product team (including product manager, designer, and engineers), not an individual. Every company varies in how they run their process, but there are some general commonalities across the tech industry. Who sets OKRs? – Product teams often set their own OKRs, with input and review from leadership. Leadership should feel confident that the objectives really serve company strategy, and product teams should feel bought-in. How often? – Quarterly tends to be a good cadence, a long enough horizon to begin to see results, but short enough to afford flexibility over the course of the year. How ambitious? – OKRs should feel a little uncomfortable; on an ongoing basis, teams should achieve about 70% of them. For this reason, low achievement shouldn’t be punished in performance reviews. In bootstrapped companies, developing features based on what customers say they need in sales or customer service contexts is often the default strategy. Sometimes these features end up being the right ones, but often customers don’t know what they really want until they see it, and it might be possible to give them an even better solution than the one they’re asking for. OKRs help respond to customers better, by tracking how the customers behave, not just what they say. This method represents a shift for many organizations, and like any other tool, the success of an OKR system depends upon teams using it consistently and wholeheartedly. Done right, OKRs have the potential to align product team effort with overall strategy and customers’ true needs. To learn more, consider resources such as the Silicon Valley Product Group Blog. 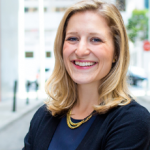 Kate is Vice President at Mainsail Partners, working with portfolio companies to accelerate growth. Her focus is in product and market strategy.